1. Thaw and press excess water from spinach using a colander. Set aside. 2. In a small dutch oven or large skillet, saute shallots in butter over medium heat until translucent. 3. Then whisk in flour until thick. Let bubble for about 1-2 minutes to reduce the floury taste. 4. Slowly pour in milk then add cream cheese and parmesan cheese (parmesan cheese optional). Stir until a thick sauce is formed. Add salt, nutmeg and white pepper. 5. Stir in spinach and minced water chestnuts until thoroughly mixed. Let cook over low heat for about 5 minutes, stirring occasionally then it's ready to serve! 6. If you need to transport this, put it in your crockpot and set to warm. Homemade creamed spinach is a favorite of mine going way back to when I use to work at Boston Market. It was actually called Boston Chicken then. Remember that?? O.M.G. Am I old? What makes Boston Market’s creamed spinach so good? Boston Market’s creamed spinach is very rich and there’s a lot of spinach. Not too much cream which I find to seem healthier and also better tasting. Boston Market uses a blend of cream cheese and Parmesan cheese. However, if you don’t have Parmesan cheese on hand or don’t want to buy an extra ingredient, this creamed spinach recipe tastes just fine without it. I’ve made it both way. If you’re looking to replicate Boston’s Market’s recipe at home though, you’ll find adding a little Parmesan cheese will give you that familiar flavor. I love creamed spinach because it’s super easy to make and is a great alternative to green bean casserole for holiday get-togethers which, for us, typically happens for birthdays and other holidays like Thanksgiving, Christmas or Easter. It’s also easy enough to whip up as a side dish for a weeknight meal. Just cut the recipe down according to your family size or make a big batch and freeze the leftovers for another day. Just reheat using the microwave or in a small pot on the stove. What exactly makes this creamed spinach recipe better than others? 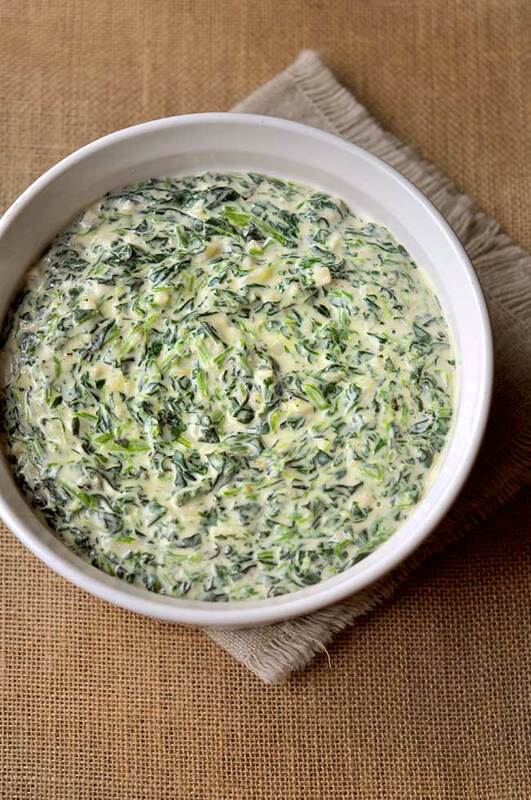 Pin this creamed spinach recipe now so you can make it later! Need more side dish ideas? I have a few for you! Browse all my side dish recipes. Dutch Oven – This allows you to cook and keep this dish warm in the oven without dirtying dishes. Oven Safe Casserole Dish – If you don’t want to invest in a dutch oven, a big casserole dish is perfect for transporting and reheating this side dish. Silicon Whisk – Silicon so you don’t scratch or mark non-stick or ceramic surfaces. Ceramic Knife – Why? Because things don’t stick to it and then roll away! Love mine. 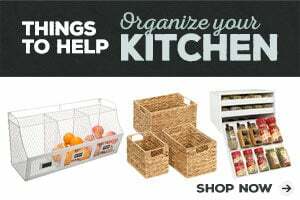 Cutting board – A no brainier but maybe it’s time to upgrade yours or get a back up? Butter Dish with Lid – Room temperature butter is easier to work with. Vintage Salt and Pepper Shakers – Okay, you don’t need these but I’m obsessed with mine. It literally makes me happy to shake salt. 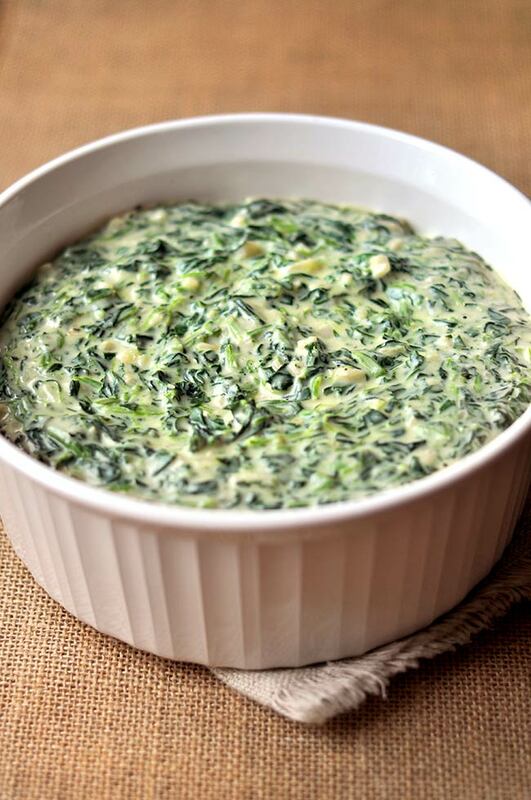 This creamed spinach recipe was featured on Wow Me Wednesday! Could you use fresh spinach? Yes, you can definitely use fresh spinach! Just use the same amount of ounces. Once the spinach wilts, it shrinks a lot so you may need several bags. Thanks for asking! the recipe calls for milk but he directions refer to half and half…..what do you prefer for this recipe? Gah! I’m clearly always indecisive about this ha ha. I usually use whatever I have. Half and half will give you a richer flavor. If you prefer a lighter, less creamy taste and fewer calories and fat, then milk will be your best bet. Both are truly good so I don’t think you’d be dissatisfied with either one.